苏洁, 刘帅. 基于隐马尔可夫随机场的细胞分割方法[J]. 哈尔滨工程大学学报, 2019, 40(2), 400-405. DOI: 10.11990/jheu.201704062. SU Jie, LIU Shuai. 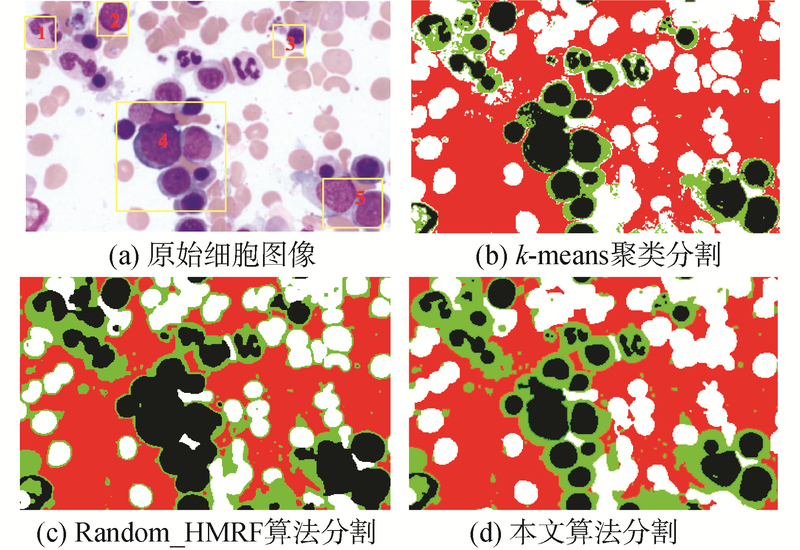 Cell segmentation method based on hidden Markov random field[J]. Journal of Harbin Engineering University, 2019, 40(2), 400-405. DOI: 10.11990/jheu.201704062. Abstract: A two-level segmentation algorithm based on spatial clustering and hidden Markov random field (HMRF) is proposed to improve the segmentation accuracy of cell aggregation and adhesion region. First, based on color feature of pixels in the Lab color space, k-means++ clustering method is used to obtain an initialization tag set. Second, the spatial expression model of the cell image is constructed by HMRF, which fully employs the spatial constraint relation to reduce the influence of isolated points and smooth the segmentation area. Finally, the model parameters are optimized by using the expectation maximization algorithm. Through the interaction between the marker and observation fields, the label set is adjusted by the iterative algorithm. Experimental results of six kinds of 780 cells from bone marrow smears of 61 cell types show that the proposed algorithm improves the accuracy of segmentation by ≥ 95%. Furthermore, the algorithm is convenient for further extraction, detection, and recognition of cell pathology characteristics. 孙立晔, 韩军伟, 胡新韬, 等. 基于Markov随机场理论的鼠脑切片显微图像的分割研究[J]. 模式识别与人工智能, 2013, 26(5): 498-503. 叶秀芬, 张元科. 基于马尔可夫随机场的非监督声呐图像分割方法[J]. 哈尔滨工程大学学报, 2015, 36(4): 516-521. 宋艳涛, 纪则轩, 孙权森. 基于图像片马尔可夫随机场的脑MR图像分割算法[J]. 自动化学报, 2014, 40(8): 1754-1763. 姚婷婷, 谢昭. 多层次MRF重标记及映射法则下的图像分割[J]. 自动化学报, 2013, 39(10): 1581-1593. 曹家梓, 宋爱国. 基于马尔可夫随机场的纹理图像分割方法研究[J]. 仪器仪表学报, 2015, 36(4): 776-786. 关涛, 周东翔, 樊玮虹, 等. 基于稀疏轮廓点模型的彩色重叠细胞图像分割[J]. 计算机研究与发展, 2015, 52(7): 1682-1691.